If you’re like me, you read reviews on sites like TripAdvisor and Amazon before you buy. But how many times do leave reviews yourself? For systems like this to work it’s important for everyone to give feedback, especially positive feedback. The same applies to choirs and singing. I rarely leave reviews on websites. When I do they tend to be negative. It’s only when I’ve had a bad experience that I take the time to let people know. The outrage I feel energises me to bother to write. But the warm glow of satisfaction doesn’t motivate me as strongly. Even though I rely on feedback from others, I hardly ever leave good reviews myself. Partly it’s because I’m a cynical, twisted, angry person inside (just kidding!). Partly it’s because it’s easier to feedback critically. Praise seems to have a limited vocabulary: ‘nice’, ‘lovely’, ‘great’, ‘wonderful’. However, it’s not fair and not equal that I use these feedback systems but don’t contribute myself. The same applies to choirs, rehearsals, singing, workshops and so on. For someone to be able to lead a choir or teach singing effectively, they need to know what works and what doesn’t. If a choir leader, singing teacher or workshop leader is good, then things go swimmingly most of the time. Singers get used to the high standards they have set. If something does go wrong from time to time, it therefore becomes very noticeable. Because it’s out of the ordinary, that’s the time when singers may give feedback. It’s as if they’ve been jolted out of their comfortable existence. Something’s gone wrong and they want to let you know. But it’s just as important to let people know when things are going right. Choir leaders (and bloggers!) are just as vulnerable as singers. If they’re worth their salt, they are constantly reflecting on their practice and can be self-critical. If they don’t receive feedback they can fill that silence with their own doubts and fears. Even though the feedback may be negative (“I’m really struggling”, “I don’t understand your explanation”, “I’m a bit lost”), it can be hard to give. These days it’s as if we’re living in that Black Mirror episode where everyone is chasing ‘Likes’ (it’s actually beginning to happen for real in China: a person’s status in society is affected by the amount of positive feedback they get). Everyone is obsessed by feedback. Every time I buy something or use a service, I get a follow-up email asking me to rate them. It can be easy to develop feedback fatigue. That makes us more reluctant to give feedback at all. 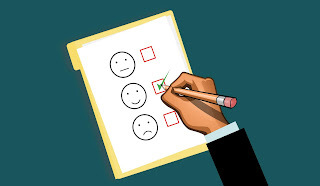 For leaders who want feedback, the secret is to not ask too often, and not to ask singers to commit too much time to the task (see Using feedback forms for choirs and singing workshops). We all know what a turn-off it is to come across a feedback form that is pages and pages long asking us to rate things out of 10. For singers, bear in mind that feedback in choirs, workshops and singing lessons is dynamic. It’s not like the ratings of products that you’re asked to give. It affects the process in the here and now. Giving feedback is part of the to and fro between teacher and singer. It’s how both parties learn and develop. feedback applies to this blog too! I’d love to hear what you think about this post (and my blog in general). My self-critical mind fills the silence with negativity: “maybe nobody is reading”, “they don’t like what I write”, “nobody understands what I’m trying to say”. Sometimes it’s hard to know what to say when you give feedback. But if you like what I write, that’s all you need: “I enjoy reading your blog”!